This is a Winter Themed Block Swap. Think of what activities you may enjoy or participate in during the winter, think about ice skating, skiing, sledding, snowmen, mitten, stocking caps etc. Let your imagination wonder free. I will swap them and mail them back out to you no later than 28 September 2018 (3 weeks ) If I receive all the blocks earlier then you will receive your blocks earlier also. If I do not receive your blocks by the deadline date, I will have no choice but to swap the blocks received from the other swappers out without you. Please make sure to read the Quilting board rules. The Swap is for sets of (4) Blocks. The limit is 5 sets per swapper. 20 Blocks maximum. I will trade out all the blocks I receive. Don't forget to make a set for yourself. Block size is 12 1/2" Sq. The sets should be the same image/block. But, different fabrics can be used. 100 % cotton fabric must be used. Any background Fabric can be used as long as it's appropriate for the theme. Applique blocks must be sewn down! Embroidery blocks whether hand sewn or machine sewn are fine also. Mail your blocks to me in a priority flat rate envelope using stamps only on the return envelope. (Metered mail expires.) Give your package time to get to me please. Make sure to address your return envelope back to yourself. Don't forget to use the proper postage. (Thank you.) Pm me for my address when you’re ready to Mail. Place your finished sets in one Large baggie. Make sure your board name is on each block. Please put the name on the front of the block it makes it easier for me to see the name and easier to swap them out. Should anything come up and you need to withdraw from the swap, just let me know. Life happens sometimes. I have a request. I am requesting that each swapper enclose One extra block in the swap theme. This block can be 6.5 or 9.5 or 12.5 inch square. This is a just in case block. In case the mail messes up and things go awry. If I need them, I will use them. I hate to disappoint anyone. If I don't need them, I will hold a drawing 2 weeks after the swap blocks have been mailed out, and whoever wins, I will send them the extra blocks. I will take care of the postage. Now, let's share early fabric pulls, ideas, and blocks and have a little fun. Hope to see you on our Winter Themed Block adventure. I'm in. All I can think of is ice crystals, cold, snow. I want to stay inside and play with my fabric. I'm in for 5 sets. I'll start working on them in very soon. I'm in! For now I'll stick with 3 sets. Thanks for hosting! Sorry, forgot to say how many. I'll say 5 set for now. They will probably all look like snowflakes or ice crystals. I do not like winter. I'm going to join. I will do 4 sets. Count me in! I will do 3 sets. I will begin winter blocks after the move. I like snowmen. Count me in for 4 sets! Ladies thank you for joining me on another adventure, this is the participating list so far. Hi, I am interested in joining though I am having trouble finding ideas of what type of blocks to make. Does anyone have any ideas they could share? Could it be any block with winter colors? Does it have to be winter imagery? Before I sign up I need to think if this is something I'll be able to do! Thank you! 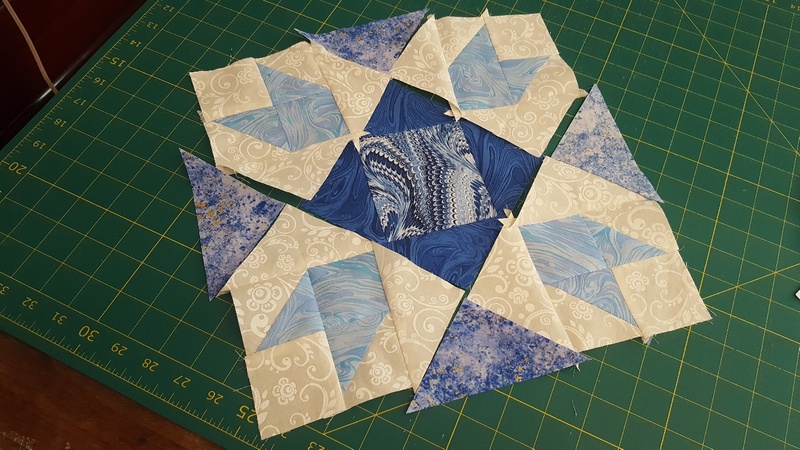 What I'm doing is a traditional pieced block using colors that suggest winter. My rendition of winter is blue, ice crystals. I've got the first block almost done but am having trouble getting the picture to load. I don't do applique so someone else can do that. Maybe I can do some trees and then some trees without leaves. If the link doesn't work then just search from the home page for the announcement and then you can start from the last page and find postings of other blocks that the ladies made and hopefully that will give you some ideals. Well, good thing I checked. Thought I had signed up, but I guess I hadn't! I'll sign up for four sets! Can't Wait! Thank you everyone! I think I'm going to have to pass on the round. It seems like a lot of fun though and I will have to join the next one! Lydia, I have you on the list already, You PM'ed that you wanted to participate. frsur33 you will be missed but I do understand, hopefully next time. 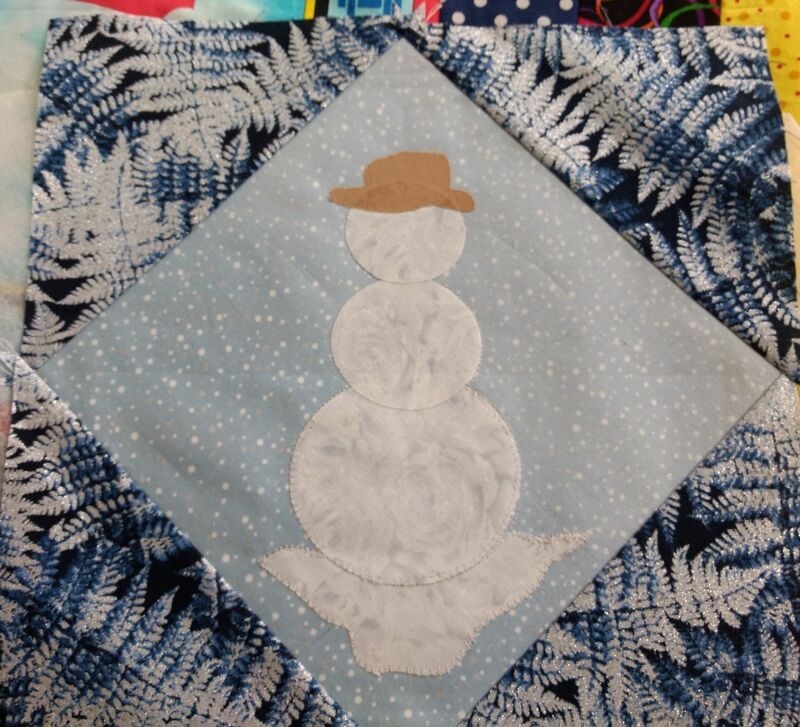 So I planned my block, digitized a cute snowman to applique on a square(or diamond) in a square block. 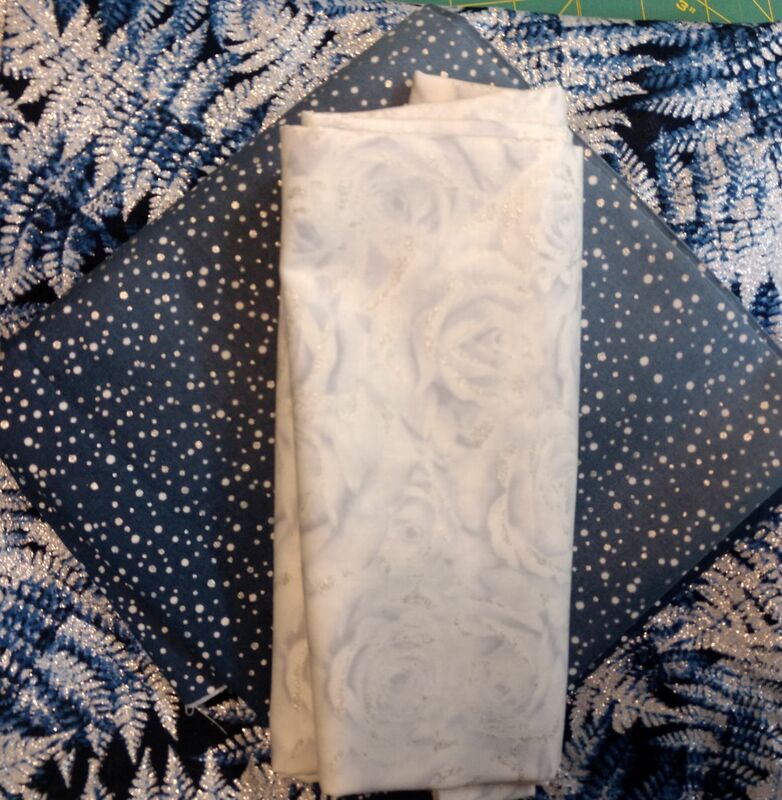 Then I went to buy some fabric that would look like a winter sky and that would make a good snowman. I anticipated the usual search for the impossible dream. Well, I walked into the quilt store, glanced to the right, and there it was, an entire rack of winter themed fabric!!! I could have been out of the store in less than five minutes, but, well, I just couldn't. You know? I love days like that! Lydia that sounds like my kind of shopping, glad you found what you were looking for make sure to share work in progress pictures. I found a cute paper pieced Sunbonnet Susan winter themed block. I am making that. One the I will applique, and 3 pieced blocks using winter themed fabrics. I will post pictures as soon as I finish with them. Fall is my favorite season but winter is a close second. 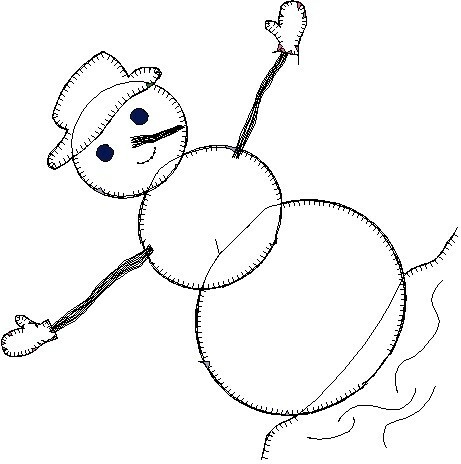 This is the snowman applique I digitized. It will be in the center of a square in a square block. And this is why one does a trial run. 1. With the very first stitching I realized the orientation of the block in the hoop was wrong. I ripped out that short piece and rehooped. 2. Since I only had the Ultra hold Heat-n-bond I used that. Normally I don't adhere my appliques when using the embroidery machine, but thought it might make this go quicker an avoid some of the steps. Well, ultrahold does not do well with fairly fine thread, which kept fraying. So I switched to the regular sewing machine, same thing. 3. Although I used a template from EQ7, my finished block just barely made it to 12 1/2 inches. SOooo, now I'll not used the ultrahold and cut my pieces just a hair bigger. I'm still going to use the embroidery machine because it does such a nice job, but will have to fraycheck the edges....just another step!